Yes, it’s that time of year. Time to try one of these warming winter “stews” — Chipotle Black Bean Chili (with bitters), or my authentic Cincinnati Chili. The Cinci chili was inspired by my cousin Anne who lives there. And yes, spaghetti makes the foundation for the south Ohio specialty. 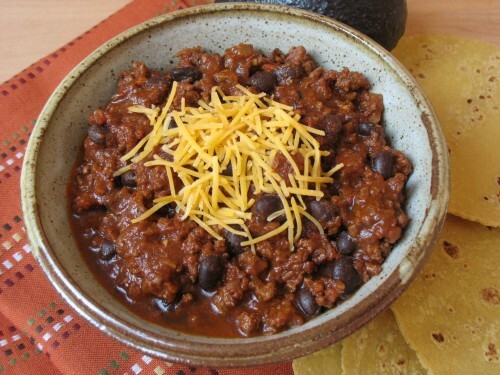 If you have a favorite chili, let us know! Tell us about it in Comments (aka Responses) below this post. If you’d like to add a link to your chili, please do so. PS: My favorite Sloppy Joes recipe is suitable for this time of year as well. Humm… Now, which to make?! Well the Chili went over like gangbusters. Seconds all around. Luckily I have some for several lunches. I must admit that I added more chili powder, garlic and salt. Other than that I followed your recipe to the letter. Great Jose! Would you make it again or revert to your usual chili? I made the black bean chili last night, and made the mistake of using the entire 7 oz can of chiles in adobo sauce! It didn’t register that 4 small chiles were going into the bowl before I blended! It was blazing hot when I tested it, but I added a second 8oz can of tomato sauce, as well as a can of kidney beans to try and cut the heat. It was still really hot, but okay topped with sour cream, cheese, and tortilla chips. Despite the heat, the flavor was soooo amazing; such a depth with all of the pieces (except the ancho chilis…couldn’t find! ), and easy to prep. This one is going into my regular rotation of Sunday night big pot dinners! SPICY! Your fix was perfect, Sienna. And dairy (sour cream or Greek-style yogurt) is the perfect anecdote to spicy food. Perhaps the recipe should be 1-2 chipotle chiles in adobo; I use 1 for half recipe, 2 for the full recipe. Hey cousin Rita! Going to have to try this! I’ve made Emeril’s vegetarian chili and it’s AMAZING. I’m sure this one is, too!